More colour ... giggles! Dog papers are normally darker and dull in my humble opinion, which does not at all reflect the nature of dogs. This paper yelps, and has a tail wag! The Clean and Simple Challenge at Splitcoast is to "Put Your Paws Up" ... so I put a paw front and centre. I also channelled Dina from the Dare to Get Dirty Challenges, but that remains a secret. Would you like to know more, visit here to read all about it. These fun papers I found on Etsy, and I just fell in love with the bright and happy colours. I have a friend who loves dogs and has a stressful job, I think I will take this to her later today for a "cheer up". I did the background and die cut with the stitched rectangle die. Using the stitched circle die I attached the paw and attached to my card base on foam strips. The "woof" I coloured using Martha Stewart Glitter Markers. 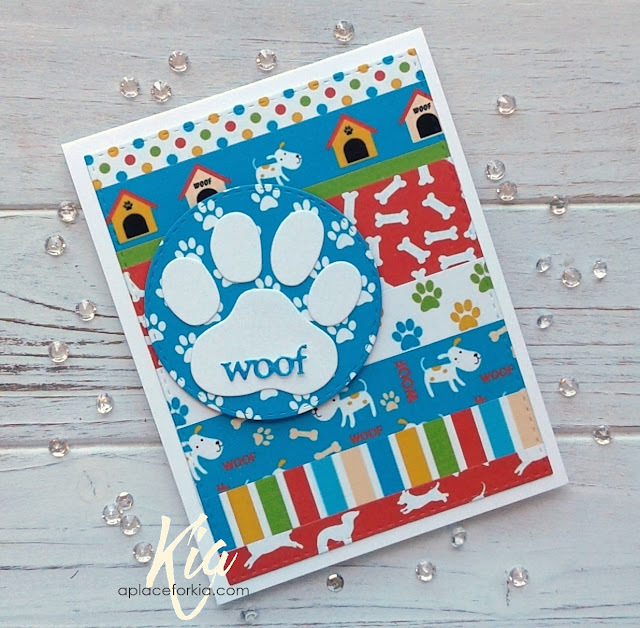 Products: Frantic Stamper Dog Paw Print Die Set and Dog Icons Set, Simon Says Stamp Stitched Circles and Stitched Rectanlges, Neenah Cardstock, Etsy Designer Paper Dogs, Foam Strips. Every year at this same time, Splitcoaststampers has an event put on by the Dirty Dozen Design Team, which I love to participate in. I am proud to say I am one of the Dirty Girls and have hosted two of the challenges for this years event. 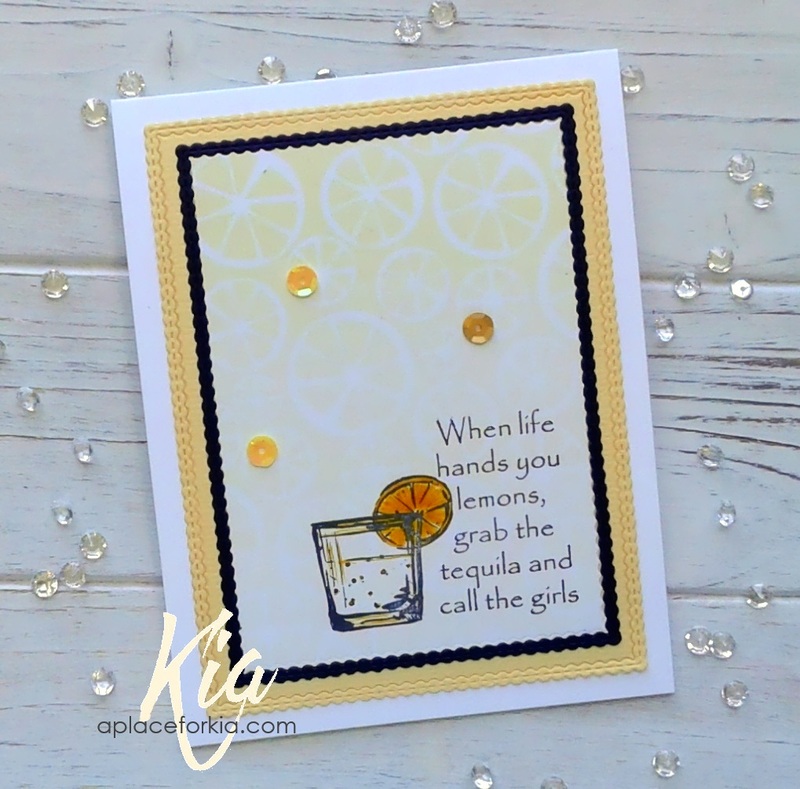 But, I have also made samples for the other hostesses, and this card is one of those. I can't tell you what the challenge entails, but you can visit here to get all the scoop. I can tell you, if you don't already know, that I love colour ~ colour makes me happy. 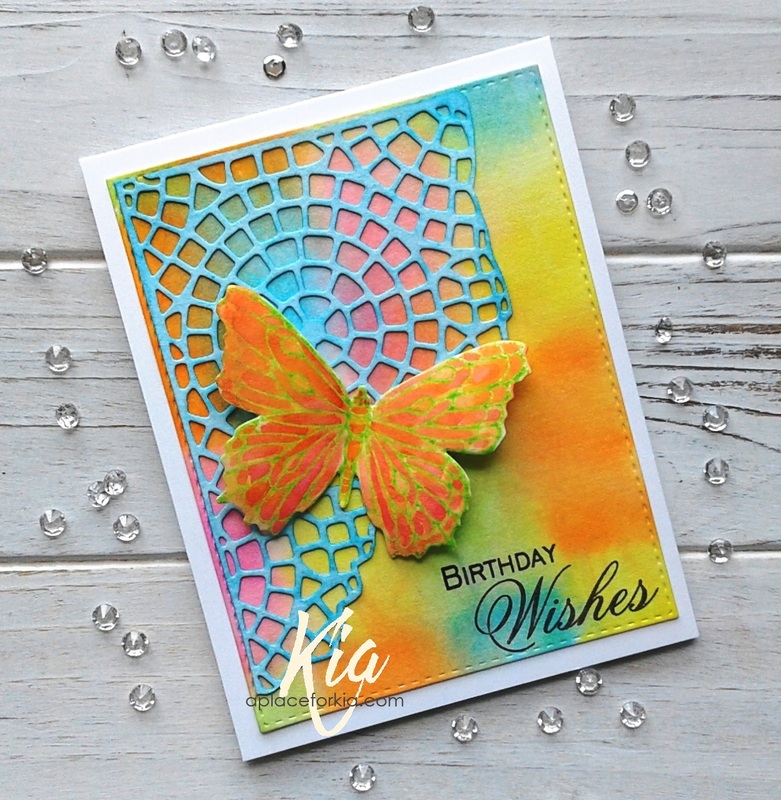 And this card has a lot of colour, done using distress inks and some shimmer mist. I wanted to use a butterfly, but wanted it to stand out against my background, so I added the mixed media die that I dragged through some Daniel Smith watercolours. I painted the butterfly using Zig brushes and stamped the sentiment using black ink. I hope you enjoy "Flutter", and thank you for visiting my blog today. Products: Stampendous PenPattern Butterfly Stamp Set and Die Set, Simon Says Stamp Stitched Rectangles, Sizzix Thinlits by Tim Holtz Mixed Media #4 Die Set, Impression Obsession Birthday Wishes Stamp Set, Zig Brushes, Daniel Smith Watercolours, Tim Holtz Distress Inks, Neenah Cardstock, Fabriano Hot Press Watercolour Paper, Clear Embossing Powder, Foam Dots. Playing with colour for this card. There is something about bright happy colours and summer that go together, and flowers of course. 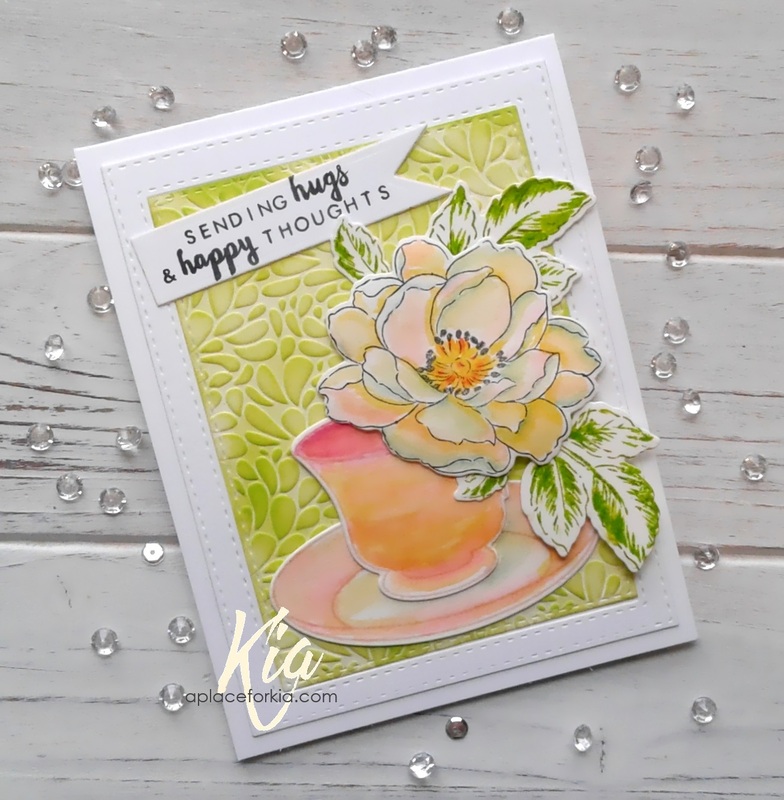 For this card, I heat embossed with white embossing powder on watercolour paper and painted with my Zig Brushes, using different colours for every flower, then two different shades of green for the smaller flowers. 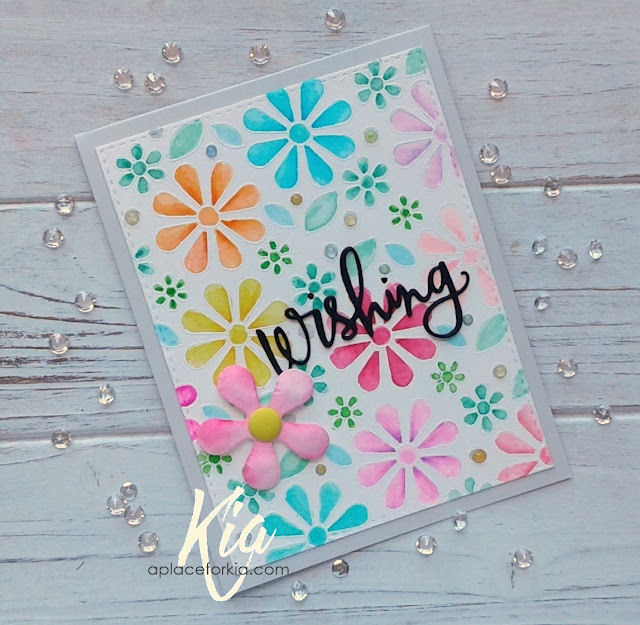 I die cut my panel with the stitched rectangle die and attached to the card base then added the mod flower die on a foam dot and the double stacked wishing die. I finished with some Nuvo Jewel Drops and a Sprinkle to the flower centre. Thank you for dropping by today ... see you next time. 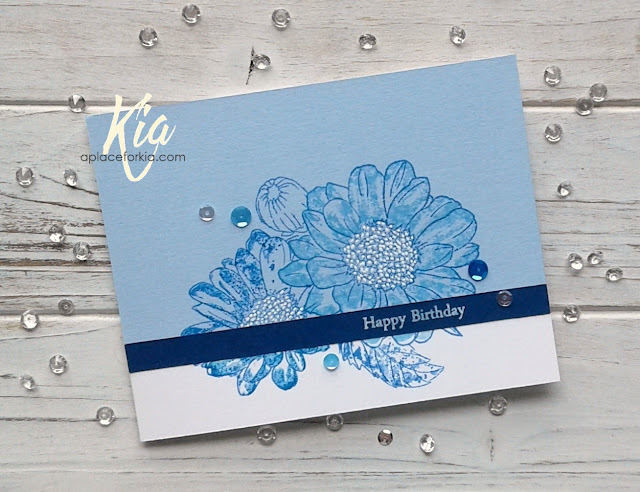 Products: Simon Says Stamp Mod Flowers Background Stamp, Frantic Stamper Mod Flowers Die, Simon Says Stamp Wishing Die, Neenah Antique Gray Cardstock, Fabriano Hot Press Watercolour Paper, Paper Garden Cardstock, White Embossing Powder, Foam Dots, Doodlebug Sprinkles, Nuvo Jewel Drops. The reason I started to make my own cards was that I loved sending cards to my friends. I had moved to Ontario from British Columbia and left some very special friends, and those friends have an appreciation for handmade, even those "rough" cards from my beginning days. Now that I am better at it, I love to share with many people. The Clean and Simple Challenge at Splitcoast is to celebrate our friends, and this is the sample card I made as part of the design team. To start, I die cut my watercolour panel using the stitched rectangles die, then stamped my image and heat embossed with white embossing powder. I then painted the image with Zig brushes, adding colour in layers. Once that was finished I did the background wash and added black ink splatters, and stamped my sentiment using sapphire ink. The panel is matted with the sapphire cardstock on Neenah Antique Gray cardstock, then finished with a few crystal sequins. 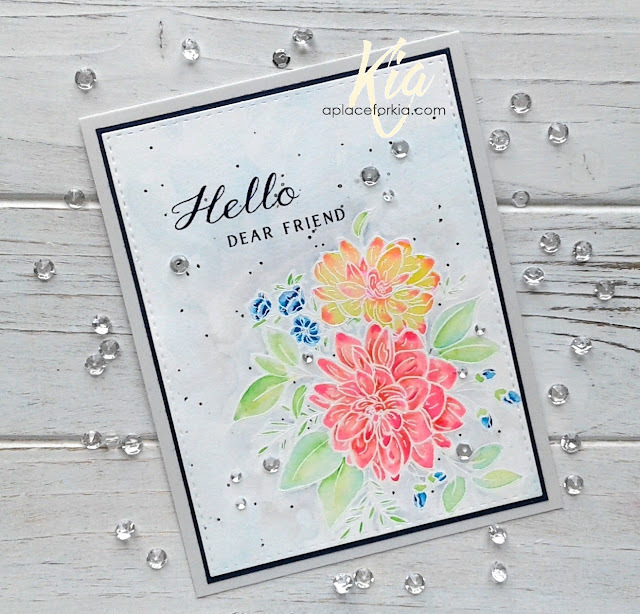 Products: WPlus9 Beautiful Bouquets Dahlias, Simon Says Stamp Stitched Rectangles, Neenah Classic Crest Antique Gray Cardstock, Bazzill Sapphire Cardstock, Fabriano Hot Press Watercolour Paper, Zig Brushes, Altenew Inks Sapphire, doCraft Marker Black, Crystal Sequins. It is a dull day in my part of town today, so a happy colour filled card is in order. For my background I first die cut the stitched rectangle, then die cut the piece again using the next die down. I then embossed that piece with the swirly embossing folder and sponged on the green, before putting together and attaching to my card base. For my card, I stamped the teacup and sauce using pink ink, the leaves using the greens and the flower using black ink on watercolour paper, and proceeded to colour using my Zig brushes. Once finished I die cut the pieces and arranged on my card. I styled the flower before attaching on foam dots. I stamped the sentiment in the black and die cut using a label die. The Zig colours I used for the flower and teacup/saucer are yellow, light carmine, pink, light violet and shadow mauve. I stamped the teacup and saucer using Simon Says Stamp Pale Blush Pink, and Intense Black for the flower and sentiment. On the leaves I used Altenew bamboo, olive and parrot. I sponged my background using the bamboo colour. Products: Altenew A Beautiful Day Stamp and Die Set, Altenew Vintage Teacup Stamp and Die Set, Elizabeth Crafts Swirly Curves Embossing Folder, Simon Says Stamp Stitched Rectangles, Spellbinders Label Die, Inks noted above, Neenah Cardstock, Fabriano Hot Press Watercolour Paper, Stylus, Foam Dots. It is that time to start thinking about Christmas cards. I like to make some of my cards that are a bit different from the norm. By that I mean, non-traditional Christmas colours. This card is an example of that. I started this card by heat embossing my snowflake stamp using silver embossing powder on white cardstock. I then die cut the panel with the stitched rectangles die and proceeded to sponge on my colours, applying more ink in a few spots. I embossed my card base with the snowflurries embossing folder and attached the panel on foam tape to the base. I die cut the peace sentiment using white glitter cardstock and finished with a few sequins. One down, so many more to do. Thank you for visiting my blog today ... I look forward to seeing you next time. 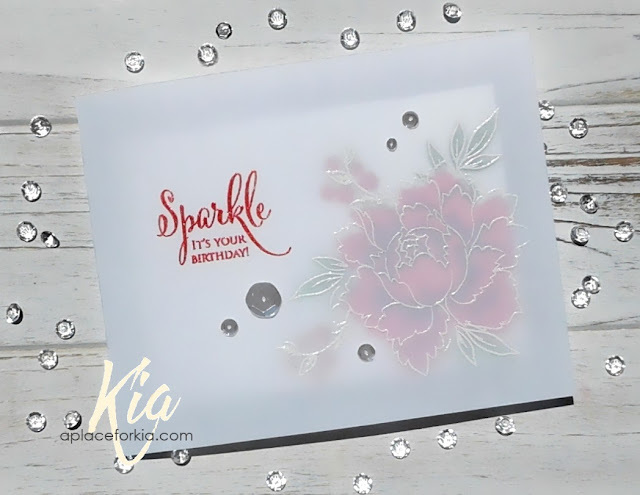 Products: IndigoBlu Snowflake Lace Stamp, Simon Says Stamp Stitched Rectangles Die Set, Memory Box Peace Sentiment, Sizzix Snowflurries Embossing Folder, Tim Holtz Distress Inks Worn Lipstick, VersaMark Embossing Ink, Silver Embossing Powder, Foam Tape, Sequins,. It is a new day and today is also the 3rd Anniversary of My Sweet Petunia. I find it hard to believe that it has been 3 years ... they have flown by. Misti changed my life as a card maker. Three years ago I did not use stamps unless I was forced into it. Today, I love to stamp and play with inks and get messy. Card making is now my passion, and I am better at what I do because of my Misti's. Iliana, inventor extraordinaire, is having a sale to celebrate her years of arduous work and, all of you for embracing her creation. Read all about it here. On to my card. This card, the pictures and details showing how I made it are up on the My Sweet Petunia site today. I would love for you to visit and read how I did it. Thanks so very much for your support. Products: Misti, WPlus9 A New Day Stamp Set, MFT Die-Namics Stitched Arch STAX, Zig Brushes, Daniel Smith Watercolour Paints for background, Simon Says Stamp Intense Black, Neenah Cardstock, Lawn Fawn Perfectly Plaid Designer Paper 6x6 Pack, Fabriano Hot Press Watercolour Paper, Wink of Stella (on berries), Foam Strips, Sequins. Products: Misti, Taylored Expressions Light as a Feather Stamp Set, WPlus9 Hand Lettered Thanks, Simon Says Stamp Stitched Rectangles, Paper Garden Cardstock, Fabriano Hot Press Watercolour Paper, Tim Holtz Distress Markers, Simon Says Stamp Intense Black Ink, Versamark Embossing Ink, White Embossing Powder, Sequins, Foam Strips. Isn't she the cutest whale ever? She is so fun to colour making for a delightful summer card for just about any occasion. I started my card by first inking up the new Simple Waves 6x6 rubber stamp and spritzing with water, then laying my watercolour paper on top and rubbing the paper to ensure contact. With the left over paper I die cut the waves using one of the Stitched Waves dies and attached to the bottom of my card. I die cut the Spouting Whale and watercoloured with my Zig brushes, styled, then attached to my card on foam dots. 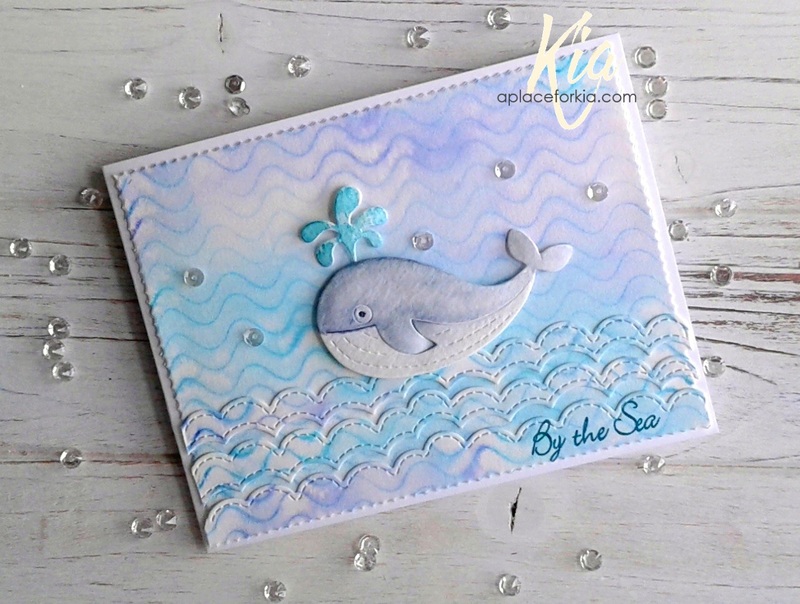 I stamped the By the Sea sentiment and added a few sequins along with some Wink of Stella to the spout and top of the whale to finish my card. Products: Frantic Stamper Spouting Whale, Stitched Waves, Simple Waves 6x6 Rubber Stamp, By the Sea Stamp Set; Memory Box Scalloped Stitch Trimmings Die Set; Neenah Cardstock, Fabriano Hot Press Watercolour Paper; Tim Holtz Distress Inks Tumbled Glass, Cracked Pistachio, Peacock Feathers and Blueprint Sketch; Zig Brushes; Wink of Stella, Sequins, Foam Dots, Stylus. 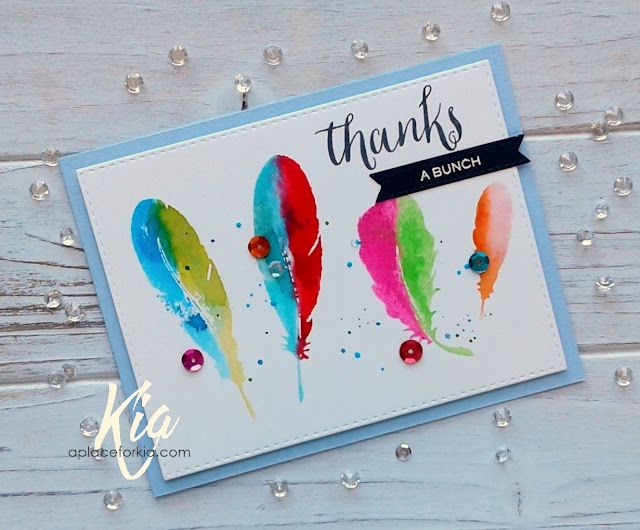 A fun stamp set from Technique Junkies to use for the Clean and Simple challenge at Splitcoaststampers today. 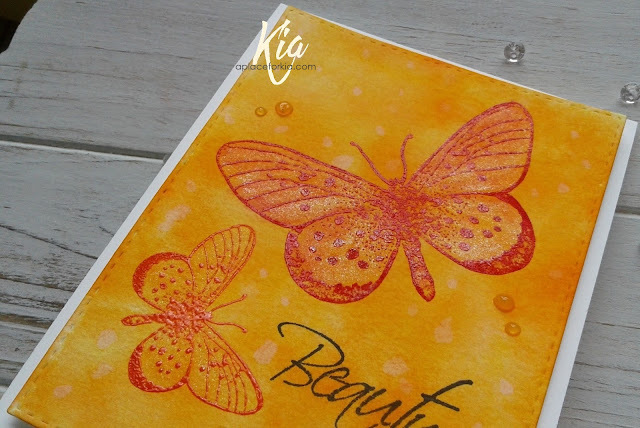 In my Misti I stamped the image a couple of times on my designer paper to get a good clean look. I added some yellow to the lemon and to the glass for a bit of colour. I then die cut the rectangle die in the black and took it apart to use just the frame around my panel, and attached this to matting done in the yellow with the frame kept attached. I added Wink of Stella to the glass, which cannot be seen in the picture, along with a scatter of sequins. A fun and quick card. Products: Technique Junkies Call the Girls, Memory Box Scalloped Stitch Trimmings Die Set, Neenah Cardstock, Bazzill Cardstock, Pink Petticoat Designer Paper, Simon Says Stamp Intense Black Ink, Zig Brushes, Sequins. The Featured Stamper at Splitcoaststampers this week happens to be a long time cyber friend of mine, Ann, and I am delighted to do this card in her honour. I picked this card of Ann's to case. 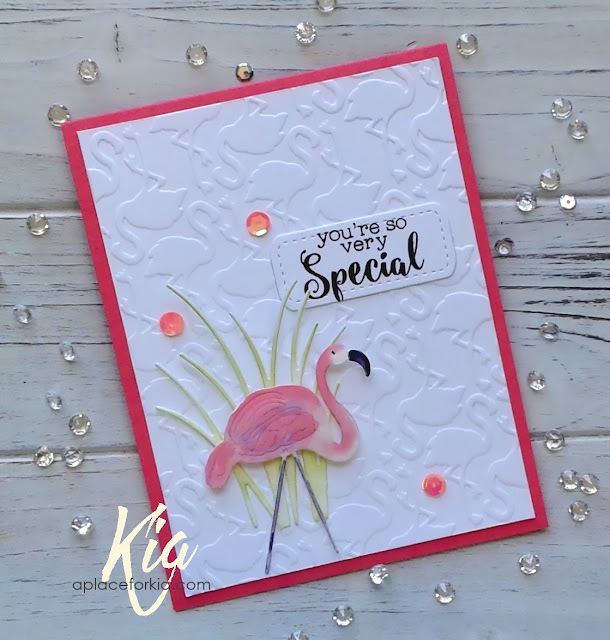 For the background I used an embossing folder full of flamingo's, which I kept white using instead a bright coral/pink cardstock for my card base. I die cut my flamingo from watercolour paper and painted the with Tim Holtz Distress Oxide Inks and Zig Brushes for the beak, eye and legs. The grass is die cut from cardstock with some citrus green ink sponged on. I attached the grass and the flamingo is attached on foam dots. The sentiment is stamped on cardstock and I used a label to die cut, and I finished with a few sequins. So fun! Thanks for visiting today, and congratulations Ann! Products: Couture Creations Pretty in Pink Embossing Folder, Frantic Stamper Flamingo and Label Die, Impression Obsession Grass, Neenah Cardstock, Paper Garden Cardstock, Tim Holtz Distress Oxide Spun Sugar, Wilted Violet, Tim Holtz Distress Ink Citrus, Zig Brushes Black, Simon Says Stamp Intense Black Ink, Foam Dots, Sequins. 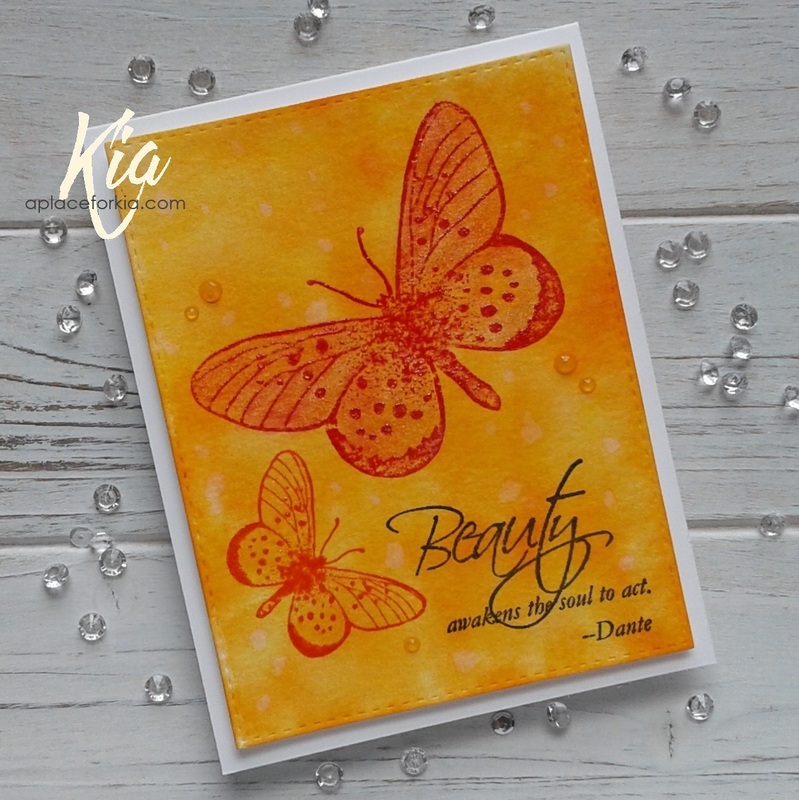 Butterflies always make me smile, and this butterfly stamp set is one of my favourites. I made this to play in the inspiration challenge at Splitcoaststampers where we visited a Pinterest site all about Macarons and Meringues. Who would have thought there was such a site? In any event, I was inspired by this display of ombre cookies. 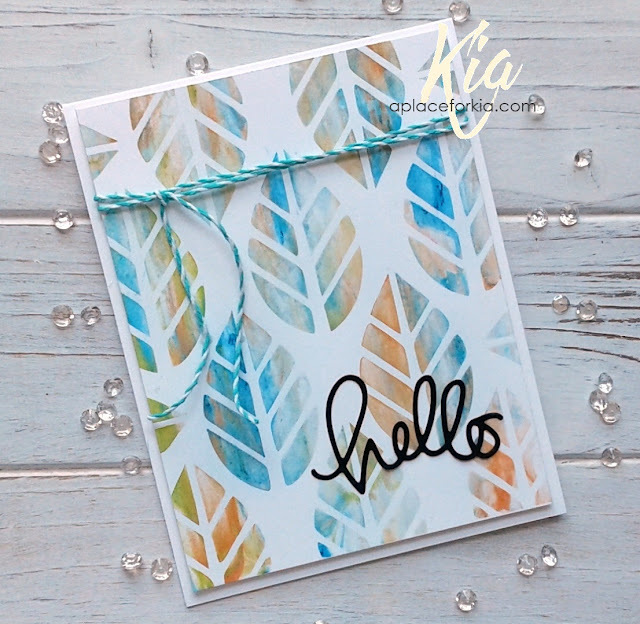 I started by stamping the background stamp and heat embossing with white embossing powder. I then brushed on the inks using Tim Holtz Distress Inks Spun Sugar, Picked Raspberry and Festive Berries. I die cut the panel with the stitched rectangles die. 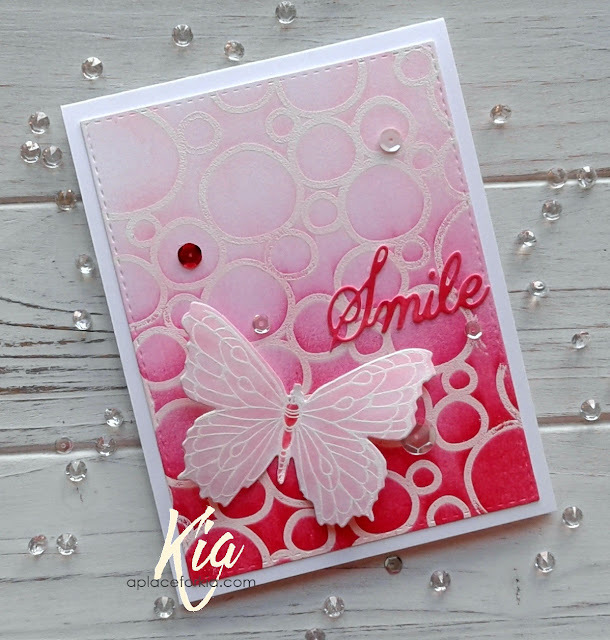 For the butterfly, I stamped and heat embossed with white embossing powder and sponged on the spun sugar to the wings and festive berries to the body, then styled and attached to the card using glossy accents for the strength, as this will be mailed. I added the sentiment, which I sponged with festive berries and a few sequins scattered about to finish my card. Products: Simon Says Stamp Stepping Stones Background Stamp, Simon Says Stamp Stitched Rectangles, Stampendous Pen Pattern Butterfly Stamp Set and Die Set, Cheery Lynn Die Smile, Neenah Cardstock, Tim Holtz Distress Inks Spun Sugar, Picked Raspberry, Festive Berries, Clarity Brushes, Versamark Embossing Ink, White Embossing Powder, Glossy Accents, Ranger Matte Glue, Stylus, Sequins. This is "Treasure", a card I did for the latest release at Frantic Stamper called "Under the Sea Fantasy". Yesterday I showed you Ahoy where I used the same Breaking Waves background stamp. Today I am using the stamp vertically instead, giving my card a totally different look. For this card I used the same technique to stamp, by inking and spritzing with water. 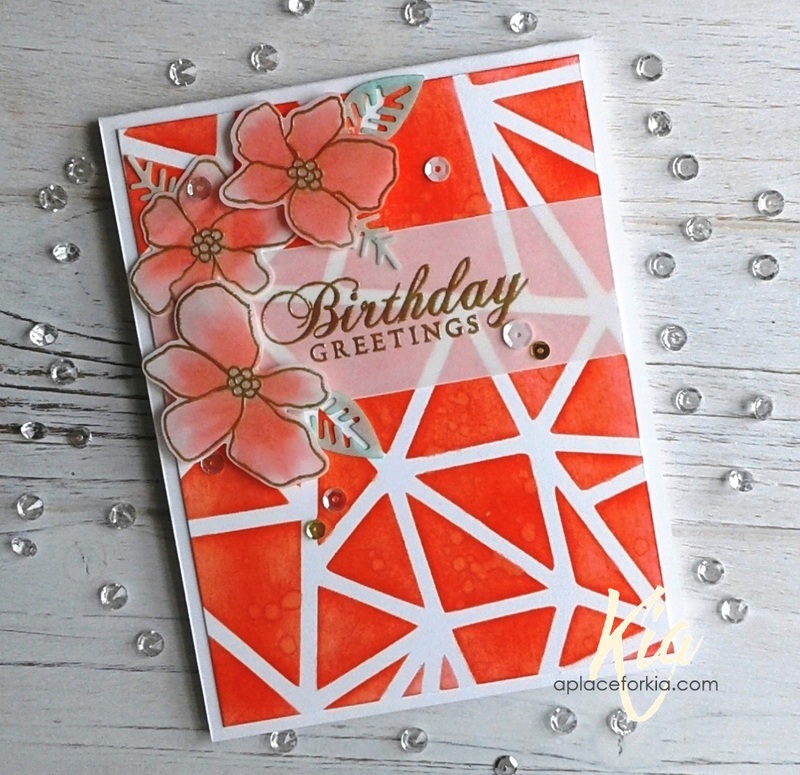 I stamped and heat embossed the diamond gem using white embossing powder, then die cut it. 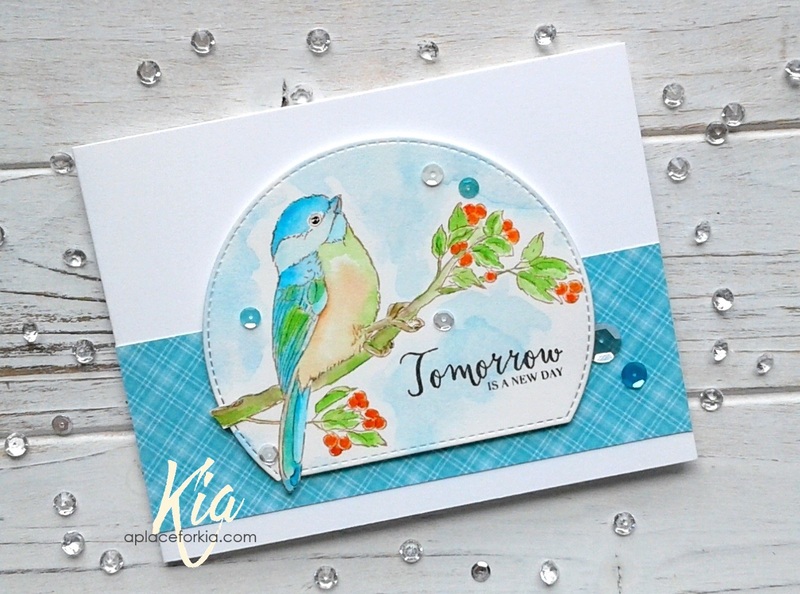 For the sentiment, which is from the You're a Treasure stamp set, I stamped using dark blue ink and die cut using Frantic Stampers Stitched Double Fishtail Labels, attached to my card base and added the diamond using a foam dot. I then die cut the Treasure die and coloured with blue glitter marker for some sparkle, then attached on foam dots. A few clear sequins finished my card. I think it makes a great thank you card. Products: All stamps and dies are from Frantic Stamper, Neenah Cardstock, Fabriano 140lb Hot Press Watercolour Paper, Tim Holtz Distress Inks Tumbled Glass, Cracked Pistachio, Peacock Feathers, Blueprint Sketch, Martha Stewart Glitter Markers, Versamark Embossing Ink, White Embossing Powder, Sequins, Foam Dots. Ahoy! 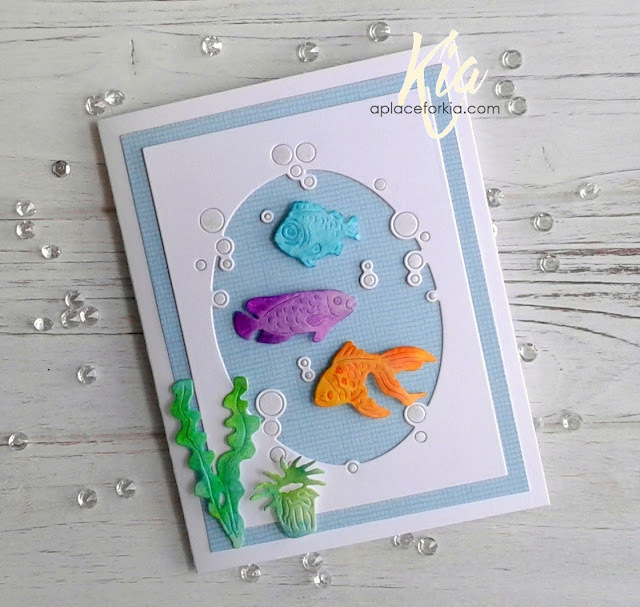 I am sharing a sample card I made for Frantic Stampers newest release called Under the Sea Fantasy. 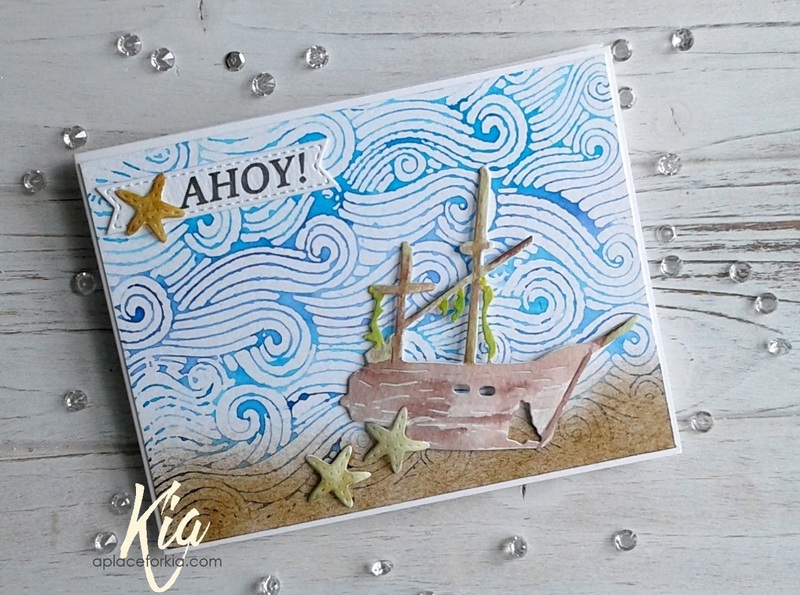 For my card I used Breaking Waves which is 1 of the 6 new 6x6 rubber background stamps included with this release. I inked the stamp, spritzed with water, then applied my watercolour paper to the stamp and ran my fingers across the paper to ensure all was transferred. Once dry I added brown ink with a stipple brush along the bottom of the watercolour paper to mimic the sand. I die cut the shipwreck, water coloured, then styled and attached on foam dots. I finished with a few starfish from the Ocean Floor Icons along with the Ahoy sentiment stamped and die cut using the stitched fishtail labels. A fun card to make ... thank you for visiting today. Products: All dies and stamps are from Frantic Stamper, Neenah Cardstock, Fabriano Hot Press Watercolour Paper, Intense Black Ink, Tim Holtz Distress Inks Salty Ocean, Peacock Feathers, Tumbled Glass, Chipped Sapphire, Gathered Twigs, Zig Brushes, Foam Dots. I have had a wonderful morning playing with this stamp set from WPlus9 called Flora and Fauna. It has been awhile since I have used this set, so today was the day. I started my card by first doing a watercolour wash for my background, graduating the colour from light to dark"ish" and dried it with my heat gun to speed up the process, then I die cut the piece using the stitched rectangle die. I used my Misti for this as it is easy with the magnets holding down the paper. I matted my background piece with white cardstock and attached to my pale pink card base. Before adding the bird and sentiment I flicked some white acrylic paint on my card, using my stamps as masks to cover the painted images. I then fussy cut the hummingbird and arranged where I wanted it on my card, then again in my Misti I arranged where the sentiment would go, stamped, then heat embossed using the white embossing powder. 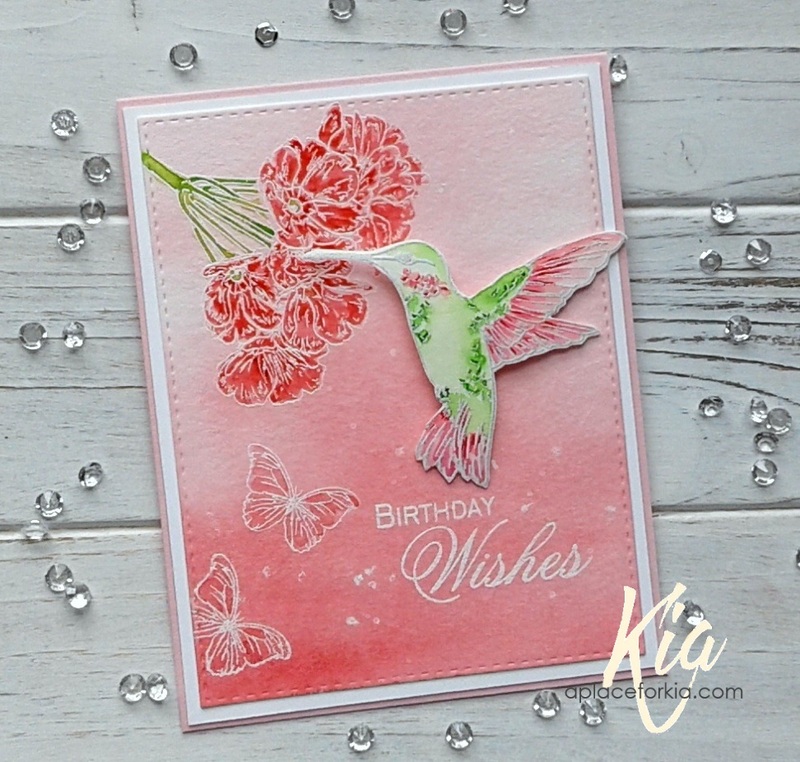 I styled and added the hummingbird to my card on foam dots, and that finished my card for today. Products: WPlus9 Flora and Fauna Stamp Set, Impression Obsession Birthday Wishes Stamp Set, Simon Says Stamp Stitched Rectangle Die Set, Paper Garden Pale Pink Cardstock, Strathmore Watercolour Paper, Fabriano Hot Press Watercolour Paper, Neenah Cardstock, Daniel Smith Watercolour Coral Quinacridone, Zig Brushes Light Green, Green, Light Carmine, Carmine, Versamark Embossing Ink, White Embossing Powder, White Acrylic Paint, Foam Dots. I found the radiant white vellum I used has a bit of glare, which is not a good thing when trying to take a picture. Next time I will use the white vellum instead, which does not have as much glare to it. In real life the flower does show through more than it appears in the picture. I first stamped the flower on the card base using Altenew Ink Red Cosmos set. I did not use the light frosty pink colour on my card, instead using the 3 darker colours included in the set. I then added the leaves using Altenew Ink Tropical Forest set. Once I was finished stamping the flower on my card base, I then proceeded to stamp on the vellum using Versamark ink and heat embossing using white embossing powder. For my sentiment I wanted to use the red, however my red embossing powder is very red. So I mixed the red with white embossing powder to tone it down a bit, but it still has that red appeal. This is also an idea that came from Jennifer, and such a good idea. To finish I added Wink of Stella to the flower and leaves on the vellum, so very pretty in real life. Here is a picture showing the flower. I hope you enjoy this card, and that you will give this technique a try. It is time consuming, but the results are worth the effort. 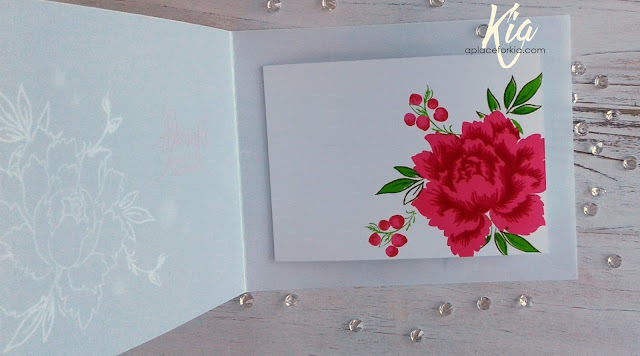 Products: Misti, Altenew Peony Bouquet Stamp Set; Penny Black Sprinkles and Smiles Stamp Set; Altenew Inks Coral Berry, Ruby Red, Grapewine, Parrot and Olive; Versamark Embossing Ink; Neenah Cardstock, 36lb. Radiant White Vellum; White and Red Embossing Powder; Vellum Tape; Ranger Multi Medium Matte Glue; Sequins.